This story on the life of AT&T's channel chief begins in Lahore, Pakistan. Zee Hussain didn’t know if he could hack it as a sales manager. At 23 years old, he was one of the youngest leaders in AT&T, and his new promotion tasked him with overseeing a team and speaking the language of technology professionals. He had impressed as an account manager and was used to coaching his peers, but this was a giant step. For our final Channel Influencer Spotlight of 2018, we explore the story of the man who leads AT&T’s partner strategy. Hussain came into a prominent channel role last year when he succeeded Brooks McCorcle and took the oversight of AT&T’s three indirect programs. Chris Percy, who has worked alongside Hussain on AT&T’s business side, describes him as a man to whom people seem to gravitate. Percy says Hussain knows how to “dig in” to a new leadership position, learn the ropes quickly and lead. “I call it the Zee effect. In our doubling down on the channel, Anne Chow, our boss, couldn’t have put a better person in that position. I think we’re stronger because of Zee in that position,” said Percy. 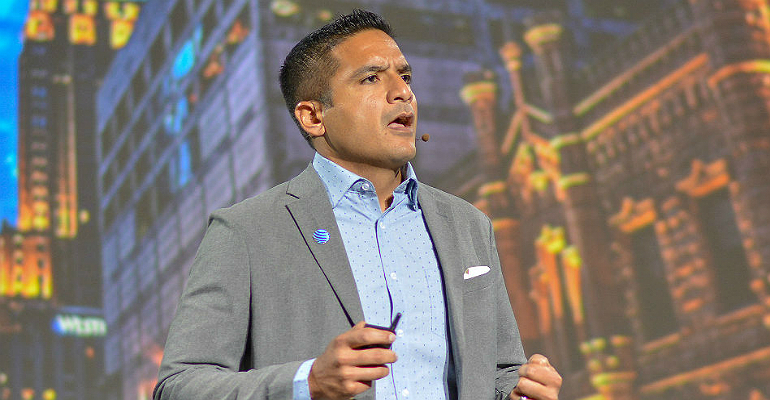 Hussain has frequently expressed his excitement for growing AT&T technological innovations like fiber, 5G and IoT, but his prognosis for the channel goes beyond products. The partners and partner programs that will rule are the ones that on a fundamental level seek to solve problems and deliver outcomes. Hussain didn’t grow up a technology lover; in fact, he never dreamed of a sales career. But his ascension to a high-ranking role at one of the world’s largest carriers followed a serious of uncomfortable events. As you read about the constantly changing tides of Hussain’s life and career, you’ll probably feel that the move to sales manager at age 23 was simply par for the course. The story begins in Lahore, Pakistan, where Hussain spent his childhood. He spent much of his time inside the restaurant his father ran. The elder Hussain and his brothers worked together as restaurateurs in a successful venture that launched multiple branches. Their signature ginger-chicken recipe was a hit. Zee recalls coming to his father’s office after school to eat, exploring the surrounding neighborhood and dropping in on the book shop, making frequent conversation with the owner of a full-service store and visiting the many small businesses in the area. Now he says he’s come full circle to be working with AT&T’s partners, who have the same entrepreneurial spirit. Then came the unexpected at age 14; Hussain’s father died of heart disease, and nothing would ever be the same again. The next six years would be what Hussain calls an identity crisis. Then came the second major change, when Hussain’s mother moved the family to Northern California to be near relatives. For the kid who lived in the same neighborhood for the first 15 years of his life, arriving in the Bay Area was a shock to the system. “That really shook us, because prior to that, our life was about as normal as you could expect. I went to the same school since first grade. I lived in the same neighborhood. I interacted with the same friends. My view of my identity and who I was was pretty clear, and my dad was a big part of that identity,” he said. Cut forward a couple of years. Hussain enrolled at UC Berkeley in pursuit of a medical degree. He was following in his mom’s footsteps and his childhood dreams. But life was more complicated than that. Strapped for cash, he got a job at Circuit City, where he learned that he had a hidden passion. He liked sales, as well as the camaraderie and social interaction that came with the job. Plus, he could make commission, and there was nothing wrong with that. Circuit City named him sales person of the month in December. He had been hired in November. He was still studying medicine at Berkeley, but a switch had flipped. Hussain says he realized that following his purpose and passion meant making a change. “As I was sitting in labs and doing work, I realized that I didn’t want to spend the next eight to nine years doing this type of work, that I really enjoy the business side of things,” he said. He earned his bachelor’s degree in economics, but the question was, what next? Many finance and business graduates from his schools went into consulting or investment banking, but Hussain had other plans. He was interested in corporate sales. He would become a businessman, just like his dad. An enticing option was AT&T, where his aunt worked. The corporation didn’t actively recruit graduates, but she convinced the branch manager to interview him. Six interviews later, in May 1999, he started with the company. He had graduated two days prior. Hussain hasn’t worked anywhere else in the last 19 years. He overachieved in his entry-level position as an account manager, and the promotions kept coming, from sales manager to director of channel acquisition sales to vice president of the company’s premier client group. And those are just a few of the many titles, capped off by becoming the channel chief and senior vice president of AT&T Partner Solutions. We started this story with a cliffhanger, but it should be clear now that Zee Hussain survived his tenure as sales manager — and then some. Chris Percy credits Hussain’s success to intelligence, a patient demeanor and likability. Hussain says little about the idea of natural talent or charisma, pointing instead to the nurturing effect of tough situations. Because for him, it was the identity crisis of his youth that put him on the path to where he is today. And there’s a lesson in that. There will always remain the pleasant memory of the simpler times in the original neighborhood and the father whose legacy lives on. Hussain’s brother owns restaurants, and last May Hussain took his wife and kids to the old stomping grounds in Lahore. Those grounds looked different, as did the restaurant. But memories came flooding back when he visited the old full-service store whose owner he had befriended. And his father would be proud.